You fancy a game of Tile Rummy but there is nobody around to play with you? Then you play a game against the computer with RRRummy! 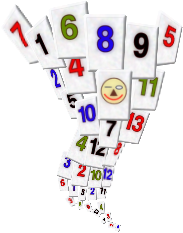 Enjoy the many game variations included in RRRummy, from Tile Rummy type games to original variations. Play against a single computer opponent, or two, or three. For an extra challenge, you set a time limit per turn, from an easy 2 minutes to a crazy 20 seconds! Pick the difficulty level that suits you best: easy, medium or hard. Or leave it at the automatic level - the better you play, the better the computer players will become too! What if you're in the middle of a thrilling game and you must leave? No worries - RRRummy will happily save your game. Then at a later time, you continue the game where you left it, and play it to a finish. Each player name can have a saved game, so if you add more player names, you can have several saved games at the same time. 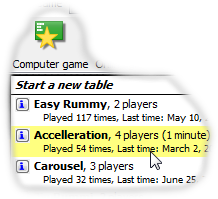 In the favorite tables list, you keep the game types that you like best, with the number of players and the time limt that you prefer. Then you quickly start those games with a single mouse click! You meet six different computer players, each with their own individual playing style. Mark the ones that you like best as favorite, and you'll meet them more often! 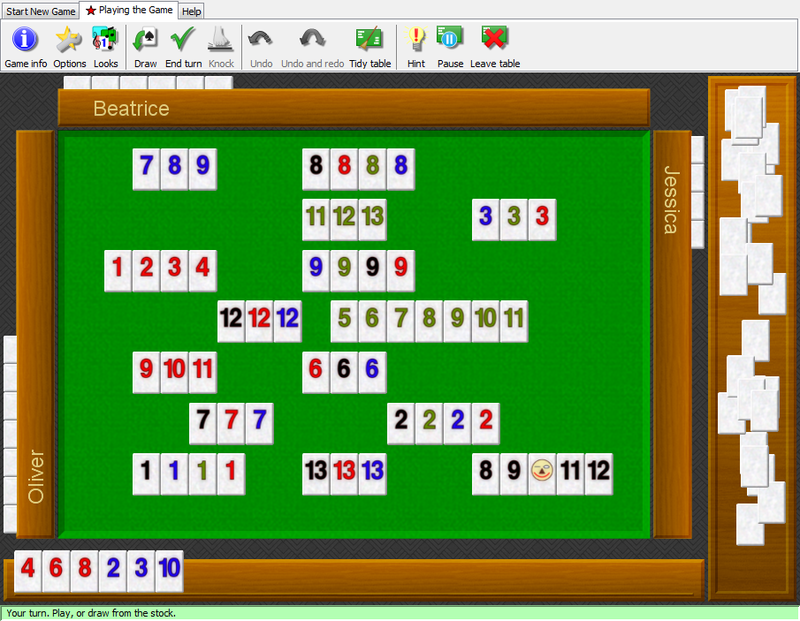 If you are used to playing Tile Rummy in a slightly different way, just design your own game variation. You'll always play the game as you like it best! If you don't use your brain regularly, it will become weaker. Give your brain a daily workout with a game of RRRummy! How would you like to organize the tiles in your hand? RRRummy can keep them for you in sequence automatically. Or you can have RRRummy organize the tiles in rows and columns of color and value, for a good overview at a glance. Or do you prefer to organize the tiles yourself? You can put them in any sequence, in one or more rows. 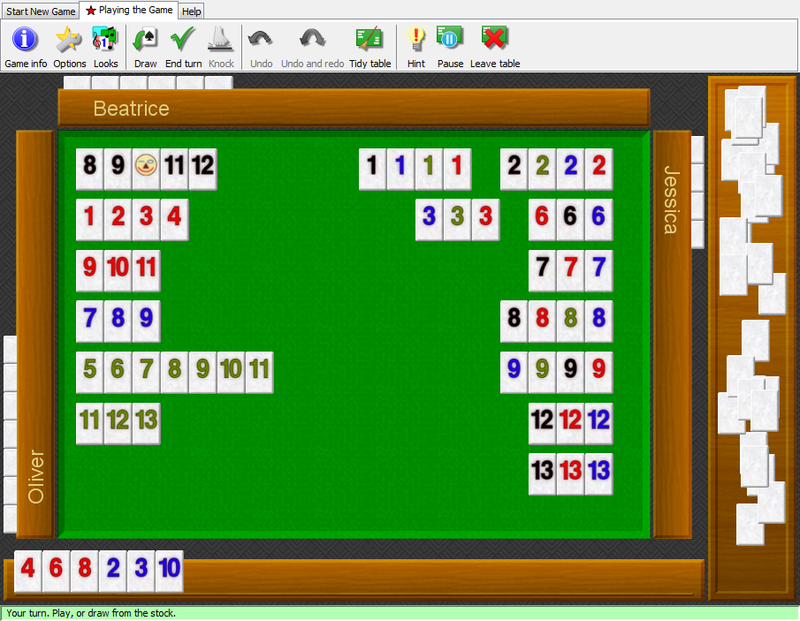 And even then, you can have RRRummy organize them with a single mouse click, as a starting point for you. When a game is going on for a while, the table can become crowded and you loose the overview. Then it's time to tidy the table, so all runs (like 456 ) are at one end, and all sets (like 444 ) are at the other. You'll quickly find new moves! You can even have RRRummy tidy the table at your every turn, so it's always neatly organized!